(NaturalNews) It was one of the dumbest "green" ideas ever proposed: Convert millions of acres of cropland into fields for growing ethanol from corn, then burn fossil fuels to harvest the ethanol, expending more energy to extract the fuel than you get from the fuel itself! Meanwhile, sit back and proclaim you've achieved a monumental green victory (President Bush, anyone?) all while unleashing a dangerous spike in global food prices that's causing a ripple effect of food shortages and rationing around the world. I think politicians need to spend less time bragging about their latest greenwashing schemes and more time studying The Law of Unintended Consequences. Because while growing fuel on cropland initially sounds like a great idea, any honest assessment of the total impact leads you to the inescapable conclusion that biofuels are largely a government-sponsored scam. With a few exceptions (see below), biofuels produce no net increase in energy output, and they cause food shortages while creating strong economic incentives for the destruction of the very rainforests we desperately need to stabilize the climate! Not all of these price spikes are due to the conversion of croplands to biofuel fields, but much of it is. As a result, it's suddenly becoming obvious to nearly everyone that the pursuit of biofuels, as currently structured, is a grand greenwashing hoax. It doesn't produce more fuel than it consumes, and it drives up food prices to boot! Now, there are biofuels programs that really do work. The growing and harvesting of sugar cane in Brazil, for example, provides an 8-to-1 return on energy investment. But even that pursuit is tarnished by claims of unsafe work environments and massive environmental pollution (the sugar cane fields are burned before being harvested, a process that releases massive amounts of CO2 into the environment). The only truly promising biofuels technology available today is based on microalgae. Feed CO2 to a vat of algae, and you can produce biofuels cheaply and responsibly, without destroying the environment. But these programs are only in experimental phases. Nobody is producing biofuels on a large scale from algae farms (not yet, anyway). And that leaves the great American breadbasket: The corn and wheat fields. It is here that food is now being displaced by crops grown for biofuel processing. So where a farmer used to grow corn as a food source, he's now growing it to sell to a biofuel processing facility which turns the corn into ethanol. Obviously, the laws of economics come into play here, meaning that every bushel of corn used for biofuels production means one less bushel of corn available for food. Factor in the laws of supply and demand, and you can see that the more crops we use for biofuels, the higher the prices will rise for food. Politicians, it seems, have no understanding of economics. They need to study the basics as they are presented in Henry Hazlitt's Book, Economics in One Lesson, which is a Libertarian-oriented guide that explains basic economics to anyone willing to learn. Economics is focused on the study of human behavior, or more precisely, consumer choice. Now, it seems, consumers are about to be faced with a choice they never wanted to have to make: Should I buy fuel, or food? In other words: Do I want to drive my car, or do I want to eat? 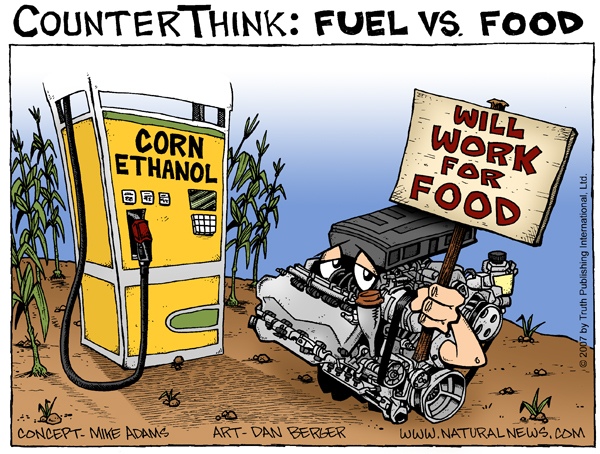 That's what this cartoon is all about: That desperate choice between food and fuel. Even the engine, as depicted in this cartoon, is impoverished, holding up a sign that reads, "Will work for food!" Under a biofuels-focused agricultural policy, the same limited resources (soil, sunlight and water, essentially) can be used for only one thing at a time. You can't use the corn twice, obviously (you can't eat the corn and process it for biofuels at the same time), so you've got to make a choice: Will you grow the corn for fuel, or for food? The more you grow for fuel, of course, the less food you have, and that drives up food prices. But if you swing back the other way and grow more corn for food to ease food prices, the fuel prices go up. Trying to solve both problems at once is a bit like trying to pick up a wet watermelon seed with your fingers: It keeps slipping to the side. Add to this the fact that global climate change is already underway, altering weather patterns and creating floods, droughts and other agricultural calamities, and you start to get the picture of just how bad things might get. That's not even to mention the very serious problem of collapsing honeybee populations due to a mysterious condition called colony collapse disorder that's devastating honeybee populations across North America right this minute. Honeybees, in case you didn't know, pollinate plants that represent about 30% of all the calories consumed by Americans. That's about one out of every three bites of your dinner, and it all depends on the "free" work performed by honeybees -- bees who are apparently going on strike by refusing to keep working for us. So, to repeat, the food bubble is now starting to implode. What does it all mean? It means that as these economic and climate realities unfold, our world is facing massive starvation and food shortages. The first place this will be felt is in poor developing nations. It is there that people live on the edge of economic livelihood, where even a 20% rise in the price of basic food staples can put desperately-needed calories out of reach of tens of millions of families. If something is not done to rescue these people from their plight, they will starve to death. Wealthy nations like America, Canada, the U.K., and others will be able to absorb the price increases, so you won't see mass starvation in North America any time soon (unless, of course, all the honeybees die, in which case prepare to start chewing your shoelaces...), but it will lead to significant increases in the cost of living, annoying consumers and reducing the amount of money available for other purchases (like vacations, cars, fuel, etc.). That, of course, will put downward pressure on the national economy. But what we're seeing right now, folks, is just a small foreshadowing of events to come in the next couple of decades. Think about it: If these minor climate changes and foolish biofuels policies are already unleashing alarming rises in food prices, just imagine what we'll see when Peak Oil kicks in and global oil supplies really start to dwindle. When gasoline is $10 a gallon in the U.S., how expensive will food be around the world? The answer, of course, is that it will be triple or quadruple the current price. And that means many more people will starve. Fossil fuels, of course, aren't the only limiting factor threatening future food supplies on our planet: There's also fossil water. That's water from underground aquifers that's being pumped up to the surface to water crops, then it's lost to evaporation. Countries like India and China are depending heavily on fossil water to irrigate their crops, and not surprisingly, the water levels in those aquifers is dropping steadily. In a few more years (as little as five years in some cases), that water will simply run dry, and the crops that were once irrigated to feed a nation will dry up and turn to dust. Mass starvation will only take a few months to kick in. Think North Korea after a season of floods. Perhaps 95% of humanity is just one crop season away from mass starvation. The truth about all this, folks, is that the resources on our planet can only support a limited population, and I think we've over-populated the planet to a point where we're wiping out non-renewable resources at an alarming rate. This means a population correction is due. When there are too many people consuming too much food, using up too much water and burning too much oil, you can get away with a rapid expansion for a little while (a few decades, perhaps), but eventually reality kicks in and there's a global population correction that brings the population size back down to levels that can be sustained on the planet. It's not a pretty picture. We're talking about the loss of a billion human lives, perhaps more. This is what's coming. It's as predictable as the laws of gravity. When you over-populate a planet and use up all the resources, the population eventually finds itself in a resource panic, and mass death ensues. You can observe the same thing with colonies of bacteria on a nutrient-rich petri dish: They will expand at an accelerating rate, multiplying their numbers until there's no more food left in the petri dish, and then they will experience a massive die-off. You might say that human beings are smarter than bacteria, and that's true, but as current events are clearly demonstrating, they're not much wiser! They still doom themselves to the same stupid fate by refusing to look at the long-term implications of their actions. The economies of our world have, sadly, been based on economic models that strongly encourage this kind of consumption and growth. We live in a "throwaway economy," where people are encouraged to consume and expend as much as possible. No corporation makes money teaching people how to use less. And so we've pushed for aggressive expansion since about the 1950's: Build more, eat more, consume more. We've turned farm lands into housing tracts, and rainforests into biofuel fields. We've over-fished the oceans, over-farmed the soils and over-extended ourselves to the point where a population correction is inevitable. We, the human race, have painted ourselves into a desperate corner, and the simple fact of the matter is that unless we quickly discover some new energy technology that provides the world with cheap, plentiful energy, we are headed straight towards a global population implosion that will leave a billion or more people dead. In time, we will either learn these lessons, or we will perish. It's really as simple as that. And all these suddenly-popular "save the planet" efforts we've seen by corporations recently are just a joke. We can't save the planet. The planet will be fine after we're gone, folks. What we're trying to save here is human civilization. The very idea that we think we can "save the planet" is arrogant all by itself. All we can do is respect the planet and find ways to live with it as polite guests living on a generous host. Whether humans survive the next hundred years or not, planet Earth certainly will. And frankly, the planet will do much better without us. With humans gone, the Earth would quickly be restored to a vibrant, pristine state, full of life and abundance. The Earth doesn't need us, folks. But we, of course, certainly need the Earth. The real question is this: Can we learn to play nice and treat the Earth with respect? If not, we won't be around much longer to worry about it. One final thought: I am an advocate of the idea that Mother Nature needs to be granted legal standing. I believe that humans do not automatically "own" nature, and that we cannot simply cut down forests, bulldoze mountainsides, fish the oceans, build dams and engage in other highly disruptive activities without first getting permission and paying royalties to a global Mother Nature Authority that stands up for the rights of the planet. Nature is not ours to own or destroy. We, as the guests on this planet, have no right to simply assume ownership over other living systems on this planet and exploit them for our own financial gain. The "destroy and consume" model of free market enterprise is simply not sustainable, folks. It does not lead us to a happy future; it leads to our own destruction. Or, put another way, over the last hundred years or so, mankind has committed countless acts of violence against nature. It has pursued a policy of committing atrocities against Mother Nature -- a kind of genocide against anything non-human (animals, plants, fish, etc.). Humans have proven themselves to be, by far, the most violent and destructive life forms to ever exist on this planet. And yet paired with that violence, humans are an infant species, with little or no foresight, with virtually no ability to see the future implications of their own actions. We are, in a sense, the dumbest intelligent creatures ever to walk the face of this Earth. We can land a man on the moon, but we can't even prevent our own rainforests from being clear-cut by soybean farmers and cattle ranchers. We can develop high-tech medicines, but we can't even openly recognize the more powerful medicines found in a simple dandelion plant. We can create amazing computers and televisions and internet technologies the beam information across the globe at the speed of light, but we pollute those information pathways with corporate ads for useless stuff and dangerous medicines that only make our fellow humans beings less enlightened. We are capable of so much, and yet we have accomplished so little. We are, by any honest assessment, a race of little children, running around the planet with far too much power and not nearly enough maturity. We're like a band of infants with flamethrowers. Frankly, we don't deserve this planet, and Mother Nature is about to take it away from us. It's time for us to either grow up, or perish. And all these people who say "we have to protect the economy, not the environment" should probably just be rounded up and shipped off to Mars where they can play with the Martian dust all they want until they finally get the picture. High-resolutions files are available for film and print. Call us at (520) 232-9300 for permission requests.